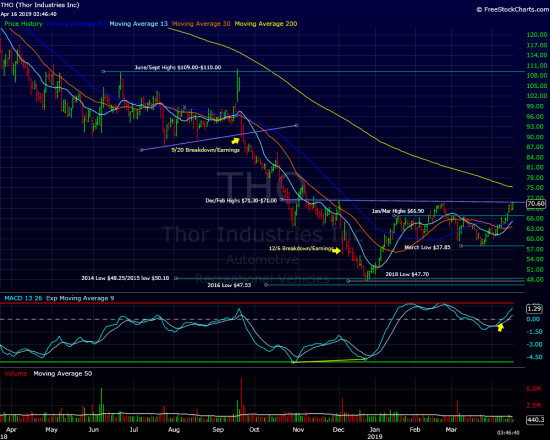 Thor Industries, a leader in the recreational vehicle industry(towables) is poised for a breakout. The stock is once again bumping up against heavy resistance near $71.00. A clear break through this zone could spark quite a run. We consider THO a fairly low risk buy near current levels. At the 2018 lows THO was down 70% from the 2018/ATH. The 2018 lows held a major support zone($50.00-$48.00=2014/2015/2016 lows). During the December sell off THO reached oversold levels(weekly MACD) far deeper than during the 2009 breakdown. THO now has a solid band of support in place between $69.00 and $67.00. The $67.00 area marks multi week highs in January and March. A key hurdle in the near term is $71.50. A close above this level on accelerating trade would be very bullish. On the downside, a close back below last week’s low($63.60) would be a warning sign. Earnings for THO are not due until early June. At time of publication we do not have a position in THO.